That number beats economists’ expectations and comes along with other good news: Job growth was revised higher for both May and April. That’s the strongest six months for job growth since 2006. President Obama’s administration welcomed the report, but also said more work needs to be done to address stagnant wages and long-term unemployment. 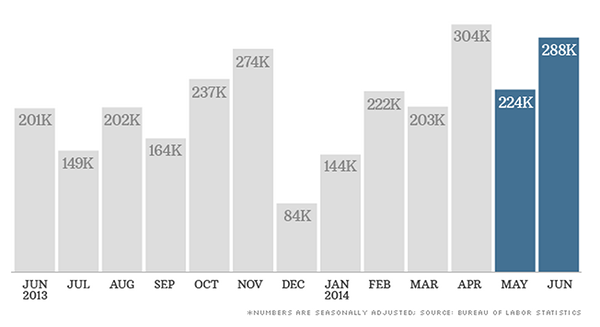 Over the past year, 2.3 million Americans have found jobs. Unemployment is down for many ages and races, although the nation’s youngest workers are still struggling this summer. One in 10 workers between the ages 20 to 24 were unemployed while 1 in 5 workers between the ages 16 to 19 couldn’t find work. Education is still the key for many job seekers. Among workers with bachelor’s degrees, only 3.3% are unemployed. For the two thirds of American workers who don’t have a college degree though, unemployment is still a lasting problem. Meanwhile, not all jobs are quality jobs. Whereas many workers reported getting part-time jobs in June, the number of full-time workers declined. As of June, about 7.5 million Americans said they were stuck in part-time jobs even though they would prefer to work full-time. But investors welcomed Thursday’s jobs report, sending the Dow over 17,000 for the first time ever. The bond market also reacted strongly. Yields on the benchmark 10 Year Treasury rose after the report came out, another sign that the market thinks the economy is improving. People around the country have noticed that the state of Washington, particularly the greater Puget Sound area, has enjoyed a higher-than-average job recovery. Our diverse and faster-growth economy is attracting tens of thousands of new residents who are drawn to our area. The implications for home buyers and sellers is clear. If you’ve been thinking about selling, buyers are lining up to buy your listing. If you’ve been thinking about buying, this might be one of the best times to buy in recent history – buying now means that you will enjoy a steady rise in the equity value of your home over the short and long term. I would be happy to review the value of your home in today’s market, and discuss the potential of the housing market in the coming years. Call me for a price estimate of your home. It may be worth more than you think!